Paneer makhni, paneer butter masala or butter paneer masala is more of a restaurant style curry whose roots lie in the dhaba food. Many highway dhabas serve a nice and thick tomato gravy with large chunks of paneer with a generous slathering of butter, served with hot tandoori rotis this Punjabi staple has quenched our hunger many times while traveling. Most of us order paneer makhni and kaali daal or daal makhni on highway dhabas just because these are fast moving items on their menu and good quality and freshness is assured. Same goes with restaurants as well, most of them make nice makhni paneer and makhni daal even if other vegetarian curries are screwed up big time on their menu. Makhni paneer is always great at highway dhabas more because they get very good quality raw milk from local sources and make their own paneer fresh. This makes a whole lot of difference to how the fat cubes of paneer behave in a rich curry. On second thoughts, the highway dhabas even have access to fresh local tomatoes too while we in the urban jungles depend on roma tomatoes and dry cardboard type tomato varieties most of the times. Good quality fresh tomatoes too would make a difference to the final flavor of this curry. Here is how I make this curry at home. This is the most convenient curry as one doesn't need to chop many things and saute or fry anything at all. Just pressure cook a few things together, puree using a hand blender and simmer with added spices and butter. Fresh home made paneer can be done on the other side of the gas stove if you wish. 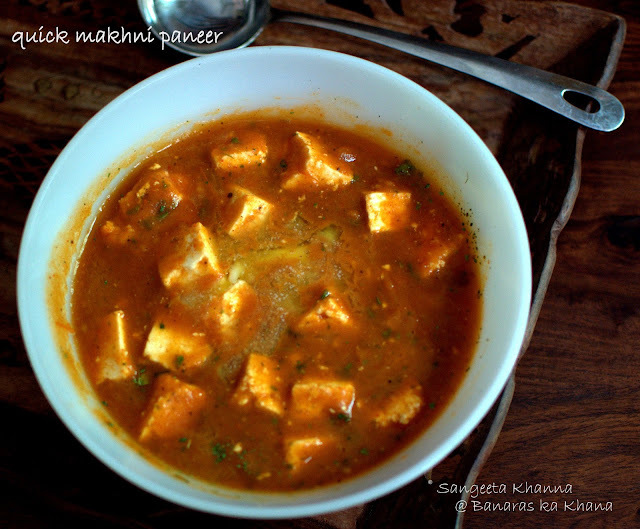 I always do that so it is a melt in your mouth type paneer makhni for us each time it is made. Although I feel the tartness or the creaminess of the gravy differs sometimes if I use different varieties of tomatoes. We get different varieties of tomatoes in different seasons but choose the freshest, deep red, fully ripe tomatoes to get the best flavors possible. I use a homemade tomato paste or sun dried tomatoes mostly to make the curry quicker, otherwise you need to reduce the gravy a bit on the gas stove. Works nicely either ways. Add about 2 tbsp tomato paste or sun dried tomato paste while pressure cooking if using. Pressure cook everything in the first list. Cooking till the first whistle blows is enough. Cool down the pressure cooker and then blend the mixture with the help of an immersion blender or using your food processor. Sieve the liquid if required. I don't sieve it ever. Return to the pressure cooker pan, the liquid will be cooked without the pressure lid now. Reduce the gravy to a desired consistency and then add the fresh paneer cubes, crushed kasoori methi and garam masala powder. Add cream if using and simmer for about 5 minutes. Adjust seasoning, add sugar if required, add the butter and transfer the curry in the serving bowl. Serve hot with your choice of flat bread. Roti, naan, kulcha or roomali roti goes well with this curry. I immensely like this process...no frying or saute...and butter on top... I have a feeling that I am going to like it..:-)..
Do we add some water during pressure cooking, or is it cooked in its own juices? No water required in the recipe if you are using fresh juicy tomatoes. Add a little if you feel the tomatoes are dry. Thank you Amrita, I am sure you would like it.